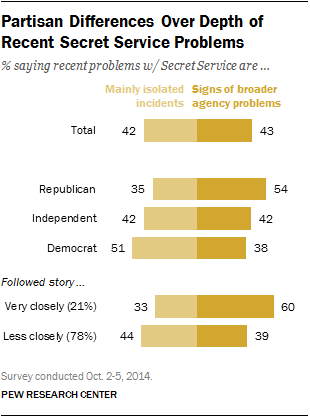 Following a White House security breach and reports of other Secret Service problems, roughly equal shares of the public think the recent issues are mainly isolated incidents (42%) as think they are signs of broader problems with the agency (43%). The new national survey by the Pew Research Center, conducted Oct. 2-5 among 1,007 adults, shows that Republicans are more likely to see these episodes as signs of broader Secret Service problems (54%) than mainly isolated incidents (35%). Among Democrats, about half (51%) say the occurrences were mainly isolated, while 38% think they are signs of broader problems. Those who paid close attention last week to Secret Service problems and the resignation of Director Julia Pierson are the most likely to see signs of broader agency problems. Among the 21% who closely followed the reports, six-in-ten (60%) say the incidents show signs of broader problems and just one-third (33%) see them as mainly isolated. About a quarter each of Democrats (27%) and Republicans (24%) followed news about Secret Service security problems very closely, compared with 15% of independents. A majority of the public has at least some confidence in the Secret Service to improve its job performance. About seven-in-ten, including roughly equal shares of Republicans and Democrats, say they have a great deal (19%) or fair amount of confidence (50%) in the agency to improve the job it does providing security. Roughly three-in-ten offer not too much confidence (21%) or no confidence at all (8%) in the agency to get better. Blacks and whites have similar views about whether recent security slips by the Secret Service represent isolated incidents or signal broader problems; about half of blacks (48%) and whites (47%) say the latter. However, blacks show less confidence in the agency to provide better security going forward. Roughly our-in-ten blacks have little or no confidence in the Secret Service to improve its performance, compared with 29% of whites. Blacks are twice as likely as whites to say they have “no confidence at all” in the agency to improve (16% vs. 8%). In general, people who see the recent Secret Service problems as signs of broader issues are less likely to express confidence in the agency to reform itself: Still, 57% of those who say the incidents are signs of broader problems have at least some confidence in the agency to improve its job, while 42% have little or no confidence. Among those who view recent reports of security problems as mainly isolated incidents, 84% have at least some confidence that the Secret Service will improve and just 15% lack confidence. The current outbreak of the Ebola virus, including the first reported diagnosis in the U.S., garnered the most news interest last week. Fully 36% of the public closely followed the story, up 9 points from the prior week. 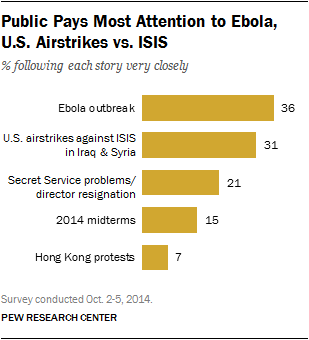 About three-in-ten (31%) closely followed news about U.S. airstrikes against ISIS in Iraq and Syria. In the week before, 37% followed news about the airstrikes. Roughly two-in-ten (21%) tracked news about problems with White House security and the resignation of the Secret Service director. In addition, 15% were closely following news about next month’s congressional elections and 7% paid close attention to political protests in Hong Kong. Among all age groups, news about Ebola received considerable attention. Three-in-ten adults under age 30 (30%) closely followed the story, as did 45% of adults 65 and older. Interest in the week’s other news stories was much higher among older adults than younger adults. For example, 25% of adults 65 and older were closely following the midterm elections, compared with 5% of adults ages 18-29.